With a flurry of fringe Balmain's Amazon Pochette makes a big impression. The vertical line of flowing fringe running down the center of this purse is really the star of the show. It ensures this simply shaped pochette isn't passed over, as it might have been without it. I love the soft suede and that pretty lilac color, but these elements can only do so much. The Amazon's interior is even simpler than its surface. The suede lining makes us feel pampered, but with only a single pocket there's not a lot to it. A magnetic snap keeps what we can carry safe, but that won't be a lot. Despite its name the Amazon is no giant, after all. But considering there's no handle to help us out, those petite dimensions aren't really a bad thing. Any larger and it's be unmanagable! On looks alone the Amazon is a pretty innocuous purse, but its $895 offends my sensibilities. No designer has any right to charge almost a grand for such a simple accessory, no matter what their name! 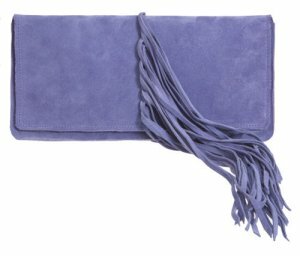 The Giuseppi Zanotti Tassel Clutch bag, a great alternative to this suede bag.